Wow! 41 new polls today. Zogby has released new polls conducted in the battleground states Oct. 13-18 and there is good news and bad news for each candidate. For Bush, the good news is that he is now leading in seven of the 16 battleground states (Arkansas, Florida, Missouri, Nevada, Ohio, Tennessee, and West Virginia), his best showing ever in the Zogby poll. The bad news is that all of these leads are within the margin of error, so they are statistical ties. For Kerry, the good news is that his leads in Michigan, Minnesota, New Mexico, Oregon, Pennsylvania, and Washington are all outside the margin of error, which ranges from 2% to 4%. But there are other polls today as well. A new poll from the University of Cincinnati shows Kerry ahead in Ohio, 48% to 46%. Rasmussen's tracking poll shows Bush and Kerry tied at 47% each in Ohio, the first time Bush has not led there for weeks. ABC News says its Kerry 50%, Bush 47%, but Fox News says it is the other way: Kerry 45% and Bush 47%. On the other hand, Survey USA has Kerry ahead 49% to 47%. All in all, Ohio is a complete tossup at the moment; it could go either way. My rule is still: most recent poll (based on the middle date) wins, with ties resolved in favor of the shortest poll. If two or more polls with the same dates are most recent, they are averaged. Currently, The Fox/Opinion Dynamics poll is the most recent by 0.5 day, so it is being used today. 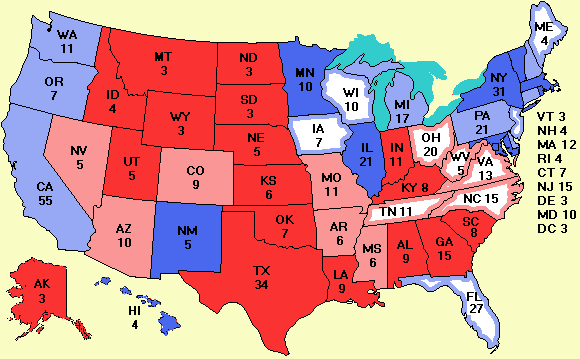 The complete list of polls is given at the Polling data link to the right of the map. Some people have said I should average over some time interval, but when I did that in early October, there was massive objection to the idea, so I am going to stick with the most recent poll from here to election day. No more discussion. It is the most objective system. But it should be obvious that many states are locked in an exact tie. The get-out-the-vote efforts will be crucial. Rasmussen also shows Bush and Kerry tied in Florida at 47% apiece, again for the first time in weeks. Early voting has already started in Florida and other states. In fact, it is expected that up to a third of all votes may be cast before election day. Overseas voters who have not yet received their absentee ballot should call the U.S. consulate or embassy in their country immediately and obtain an emergency write-in ballot. The deadline by which absentee ballots must arrive varies from state to state as shown in this list. In most states, the deadline is the closing of the polls on election day, but in some states it is earlier. If you are overseas and have not yet voted, it is essential that you do it this week. If snail mail from your country to the U.S. takes a week or more, you might even consider using an overnight express courier. Absentee ballots arriving after the deadline are not counted. A new Gallup poll taken in Colorado Oct. 15-17 on amendment #36 to split the electoral vote in proportion to the popular vote is now behind, with 53% against it and 39% for it. Rasmussen also conducted a poll asking if people thought voting would go smoothly or we would get another mess in Florida like last time. 58% of the people expected another mess. Not a good sign that most people don't have much faith in the election process. Surely the richest country in the history of the world can devise voting procedures that work correctly. A good start would be to have the election procedure in each state be supervised by two people, one Republican and one Democrat, instead of by highly partisan elected officials. Both campaigns are running scary ads to frighten voters into voting for them. At Devincible.com there are some mock commercials that are satirical rather than scary. They poke fun at both candidates. The site is called "The Truth about John Kerry." One of the ads poses the (rhetorical) question "Should you vote for a man dumb enough to believe George W. Bush?" Worth watching. Since I don't think too much of the predicted map based on the linear regression lines, I decided to make a new map based on a much better model. Here is the model. 1. Voters currently preferring Bush or Kerry will actually vote for them. 2. Nader will get 1% where he is on the ballot, 0% where he is not. 3. The minor candidates (Cobb, Badnarik, Peroutka, etc.) will get 1% total. Here is the rationale. Number 1 is easy. A lot of people have made up their minds. There is little chance they will switch now. Number 2 is based on the fact that although Nader got 2.7% in 2000, many Naderites (Naderonians?) have been wearing goat-hair shirts and engaging in self flagelation since then for helping to elect Bush. Nader will surely get fewer votes this time. I have guessed at 1% based on today's Zogby polls in which he is averaging 0.5% in 16 battleground states. Number 3 is based on the fact that the minor candidates got 1.01% in 2000. Number 4 is the hardest, but there is some hard data on how the undecideds break. Nick Panagakis analyzed 155 elections, specifically looking at polls taking two weeks before an election. In 127 cases, the challenger got most of the undecided vote. In 9 cases the undecided vote was split equally, and in 19 cases most went to the incumbent. Panagakis' study was done in 1989, but it has been updated recently by Chris Bowers. He studied polls and elections from 1976 to 2002 and examined the differences between the final polls and the actual vote. On the average, the undecideds went for the challenger 2:1. This is the figure used in the model. The consequence of this historical fact is that in states where Kerry is tied now or even 1% behind, he will probably win. The predicted map is at www.electoral-vote.com/pred. This is a stable page, which will appear on the menu under the map as "Predicted final results", and can be bookmarked. It will be updated daily and old ones will be archived. The old-style linear regression predicted map is also reachable from this page. I think this new predicted map is much more solid than the old predicted map because it is based on a large amount of current and historical data. The page listing the military service of numerous public figures has been updated. It has also been placed on the More data page for future reference. Similarly, the pollsters page has also been updated. Senate news: In an unusual move, the two largest Kentucky newspapers, the Louisville Courier-Journal and the Lexington Herald-Leader have both endorsed challenger Dr. Daniel Mongiardo (D) over incumbent Sen. Jim Bunning (R) on account of the incumbent's bizarre behavior. It is increasingly obvious that the voters of Kentucky don't want to get themselves into a situation in which people talk about Mitch McConnell as the senior senator from Kentucky and Jim Bunning as the senile senator from Kentucky. As the Courier-Journal so aptly put it: "Sen. Bunning could readily put to rest any concern that a health problem may be the cause of his odd behavior and absences. All he has to do is hold public forums and press conferences, speak on the issues and answer all questions." If he continues to hide from the people of Kentucky, he will continue being hammered. The most recent poll shows Bunning and Mongiardo tied, down from Bunning's 10% lead only a few months ago. I have now installed a fifth server at www.electoral-vote5.com as yet another emergency backup. There is scheduled maintenance at my main provider HostRocket.com this evening so they can install a faster Internet connection. If you try later today or in the future and the main servers are down, use one of the backups. If the attackers goal was to get me to spend some money, they succeeded; if the goal was to silence me they failed completely.